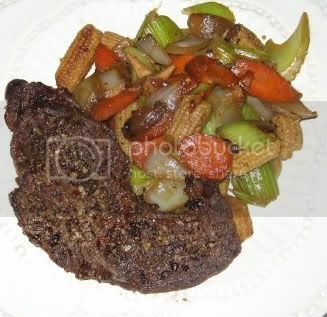 Broiled Steak & Stir Fry Veggies - Kosher In The Kitch! Broiled Steak & Stir Fry Veggies - Kosher In The Kitch! Veggies such as carrots, celery, onions and baby corns. Marinate steak in duck sauce and sprinkle Montreal steak spice on it. Broil 9 min on each side. Stir Fry the veggies, carrots, celery,onions and baby corns. Once ready, sprinkle Tamari sauce and salt on them.